Brownie Almond Biscotti are a sweet and chocolaty twist on the classic Italian cookie. Make a batch to dunk in your morning joe. Brownie lovers unite! I have whipped up a delicious biscotti recipe that will have chocolate lovers drooling. Shut the front door! Biscotti have been a staple in my parent’s house since I can remember. Mom always makes them during the holiday season. While my dad sits anxiously at the table with a cup a coffee ready to dunk one of these bad boys. Dunkin’ biscotti is an art you know. While my mom usually makes the traditional almond version of this delicious Italian cookie (because that is what dad likes), once in a while she thinks outside the box and creates a different biscotti recipe. Mom is an amazing baker and this Brownie Almond Biscotti just proves you never know what is in her baking arsenal. Simply translated, biscotti means twice baked in Italian. 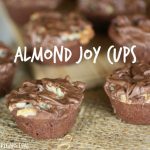 They are so ridiculously easy to make too, with so many different variations. This recipe is like brownie overload. It’s the best of both worlds, a nut brownie in the form of a crispy cookie. Oh my! Can you say drool-worthy? Once the dough is prepared, it is formed into a log and baked for about 25 minutes. After it is removed from the oven, use a serrated knife to slice the log into one-inch slices. The biscotti and then put back in the oven to bake for about 15 -20 minutes until nice and crispy. And presto! 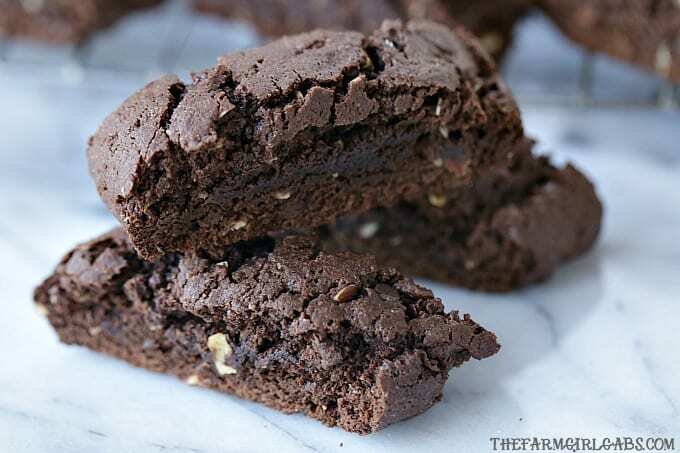 You have just made a delicious batch of Brownie Almond Biscotti. Grab a cup of joe, dunk and enjoy! In the bowl of a mixer, combine the butter, eggs and vanilla. Mix well. In a separate bowl, mix together the flour, sugar, cocoa, baking powder and baking soda. Gradually add to butter mixture just until combined - dough will be crumbly. Turn dough onto a lightly floured surface and knead in almonds and chocolate chips. Divide dough in half. On an ungreased baking sheet, shape each portion into a 12-in. x 3-in. log, leaving 3 in. between the logs. Bake at 325° for 30-35 minutes or until tops are cracked. Cool for 15 minutes. Transfer to a cutting board and cut diagonally with a serrated knife into 1/2-in. slices. Place cut side down on ungreased baking sheets. Bake for 15 to 20 minutes or until firm and dry. Remove to wire racks to cool. Save this Brownie Almond Biscotti recipe for later by pinning the image below to your favorite Pinterest board.